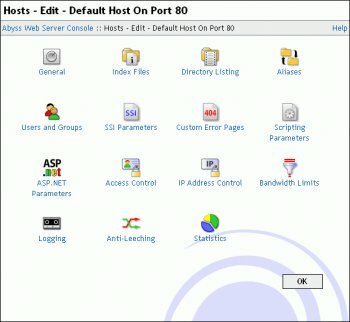 Abyss Web Server X1 is a free, personal Web server. Despite its small footprint, it supports secure SSL connections (HTTPS), CGI scripts, FastCGI, ISAPI extensions, ASP.NET, server-side includes (SSI), URL rewriting, download resuming, caching negotiation, logging, custom error pages, password protection, IP address control, aliases, custom MIME types, index files, custom directory listings, anti-leeching, and bandwidth throttling. It also features an automatic anti-hacking system and an intuitive multilingual remote Web management interface. With it, hosting your Web site and your PHP, Perl, Python, ASP, ASP.NET, or Ruby on Rails Web applications takes only a few minutes. Apache is the best for high-end production/power-users. The webserver states it supports Classic ASP, though it does, it's not free. According to seliSoft they're product is no longer freeware. I'm sorry I didn't write a full review on the product, I'm sure it's fine. But I was looking for classic ASP support because the new Windows Vista is very expensive and I was hoping for a thirdparty webserver for testing ASP scritps and I'm sure others are thinking about it too..
Makes setting up a webserver as painless as possible. I doubt I'll use it for production work, but for throwing a webserver together quick I will definately turn to this first. It simply just works - Great, much, much better than I ever would have thought! Excellent! Just what I was looking for. Very nicly written and good for many web solutions. The flexability is awesome. One drawback example - this server doesn't have built-in SSL support, even in their 'Full' version. You can kind of shoestring it together w/ stunnel and such, but still not mature in several ways as apache or IIS is. Does it's job with minimum fuss. This program does PHP and ASP? Thats impressive actually, (even though I pesonally never use ASP, some of our customers do). Looks like it might be a competitor for Apache. Best web server for windows. Hands down. The very first webserver I ever used. It's very easy for newbies and with the forum you'll find everything you need to know about using your own server. If you've never used a web server BE SURE TO START HERE!!!! This is a brilliant piece of software!! If you need any help, stop by http://aprelium.com/forum , and register. The folks there'll help you! Very easy to configure. Just brilliant, brilliant I tell you! I use it privat for share my schoolwork. really nice, now it is easy to realize a Web server. Very good program! Just want something for a bit of local development, and this should do the trick!